The following series of pictures were submitted by Jeff (AZlambo) to LamboPower.com. He suggested I also place it here also. Basically, that is what I did. 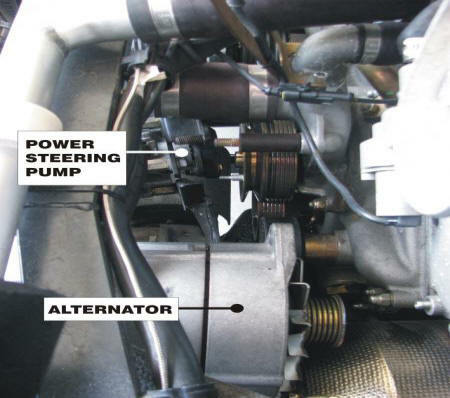 You've got three components to screw around with: The A/C compressor, the Power Steering Pump, and the Alternator. Remove the tensioning bolt from the A/C compressor, and remove/loosen all "Allen wrench" bolts from it. The nuts are all 17mm. Various lengths of 17mm wrenches will help, and a little grinding on some of them, so they will fit in there better is a nice touch. 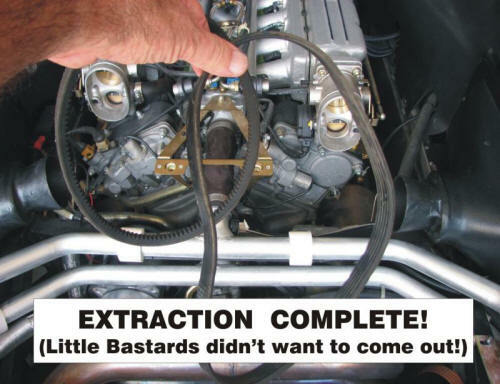 Do the same with the alternator. Remove the heat shield from the right side of the alternator to give you some more room. Remove the smallish "paper clip looking" slotted alternator tensioning adjustment bracket at the top left of the alternator. The last thing to do regarding the Alternator, is to remove the lower long bolt that the alternator pivots on. There is no nut on this bolt...it goes into a threaded hole. After that, wiggle, pry, etc. the alternator to the right, to get it loose. 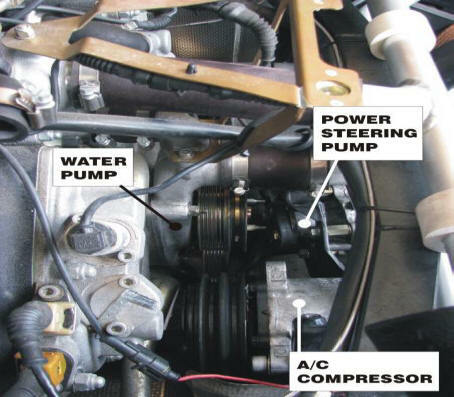 Now, the main thing you have to "dink" with is the big bracket around the power steering pump, and, the power steering pump itself......as it needs to be separated from its own pulley and the water pump pulley. 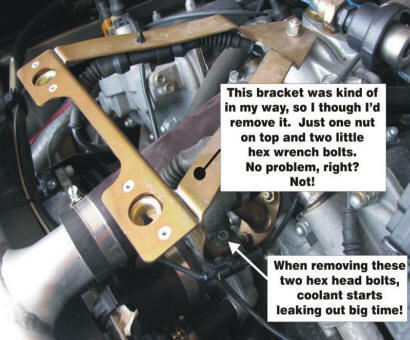 LEAVE THE BRACKET ATTACHED TO THE POWER STEERING PUMP. DO NOT REMOVE THE FOUR BOLTS WITH THE SPACERS THAT ATTACH THE BRACKET TO THE POWER STEERING PUMP. LEAVE THESE TOGETHER AS A UNIT. The power steering pump's pulley is attached to the water pump's pulley (what a squirrelly idea that was!). The key to getting the belts out, is to separate the power steering pump from these two pulleys. The "gap" that results from this is the "gap" that allows you to slip out the belts. 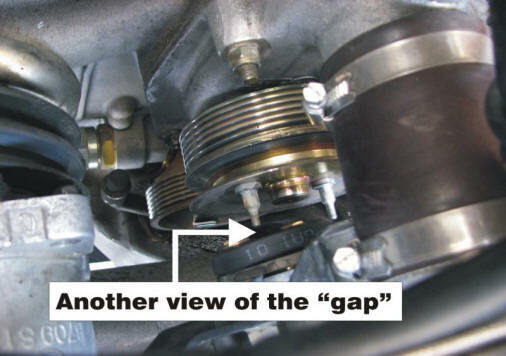 Remove the two little 8mm nuts in the INDENTED area that attach the power steering pump to its pulley and the water pump's pulley. You may see one of these very plainly and easily. The other one is 180 degrees on the other side.........but, once the tensioning is off the belts, you can rotate the power steering pump pulley around and viola!.......the other 8mm nut is right there! The last thing is to get the bracket holding the power steering pump off of its three fastening points. The top middle point is easy. It involves just removing the nut from the bolt coming from the top of the water pump casting (the one with the long spacer on it). The left mounting point goes to the bottom right bolt on the A/C compressor. Again, not too much of a pain. The third mounting point, way over to the right, is that long bottom bolt on the alternator, that is the pivot bolt for the Alternator. Okay, piece of cake, right? 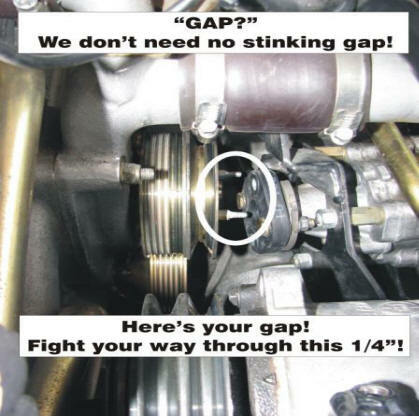 You now pull back on the Power Steering pump, and wiggle, shimmy, cuss at it, and do everything in your power to create as big a gap as you can between it and the two pulleys. Good luck!...........I managed about a 1/4" gap. The A/C compressor belt is about 1/2". After many cuss words, I managed to squeeze the 1/2" wide belt through the 1/4" gap!